Now that you have done a full body cleanse let look at ways you can maintain a healthy program to ensure that your digestive health flourishes. Food combining is a hard one to get used to doing, because we eat when we feel hungry. How many of you think about what foods to eat and when? Its not easy to change habits of a lifetime but if you wish to be free of digestive issues, the time to start is now. If you have never tried food combining, then give it a try, it works. When you simplify the foods that you eat in one sitting your digestive system will not be overtaxed. 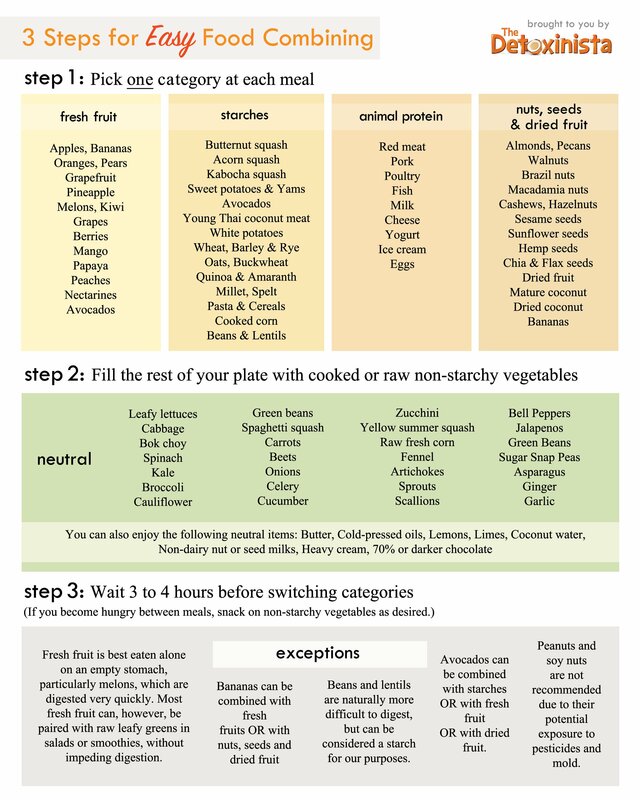 The best guide I have found that is easy to follow is from Detoxinista. The group of foods in Step 1 are in their own individual boxes, don’t cross-combine, instead select from step 2 then wait before selecting from step 3. The first time I practiced these steps, I ate my protein first, waited a few hours then ate carbohydrates. I was surprised that I did not spend my time afterwards burping and being bloated like a balloon ready for take off. By waiting for a period of time before switching food categories, I also found I did not need to eat as much unhealthy snacks. When I became hungry it was my next mini meal that I consumed instead of snacks. If you eat all your food in one sitting then guess what – you snack on things that do not help your digestive system. Take flax oil and omega 3 fats with meals to help break down foods, and these oils are also good for the gallbladder. If there is one thing to remember is that protein requires HCL (hydrochloric acid) to be digested and carbohydrates reduces the production of HCL. Instead eat carbohydrates with vegetables. Its not always easy to combine foods that suits our body chemistry and for those of you that is disciplined and can do so, a big hand to you. However, I find that using a good digestive enzyme made with ox bile does wonders for the digestive system. See this list of high carbohydrate foods which should not be eaten with protein.